Traffic barriers were installed on Glenmeade Circle in Purcellville to stem the flow of cut-through traffic. 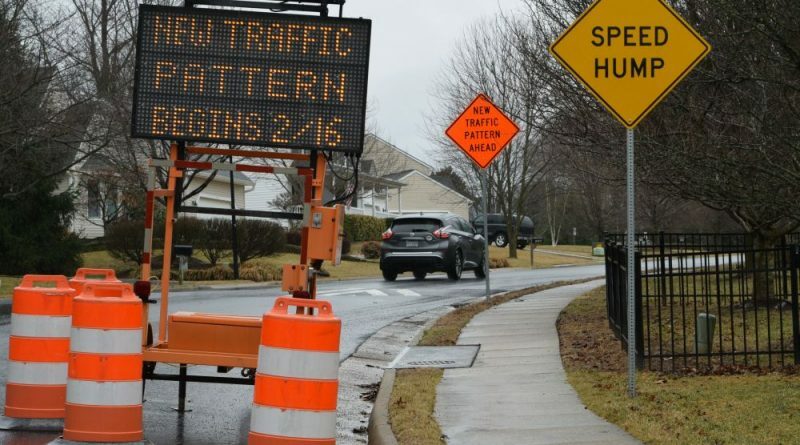 Five months after the Town of Purcellville backed a plan to block cut-through traffic in the Country Club Hills and Catoctin Meadows neighborhoods, the town staff and residents could be moving closer to a more agreeable solution. The Town Council on Tuesday night implemented a new pilot project that will use signage to restrict cut-through traffic during weekday morning and afternoon peak hours. Recommended by the Technical Advisory Committee, which was formed last month to address the neighborhood’s cut-through traffic concerns, this new plan will install “do not enter” signs at the Main Street entrance to 33rd Street, restricting traffic from 6-9 a.m., and at the Country Club Drive entrance to 33rd Street, restricting traffic from 4-6 p.m. An additional “no outlet” sign will be installed at the 21st Street entrance to Ashleigh Road. “It seems like it’s an option that’s worth considering,” said Interim Public Works Director Dawn Ashbacher, who has led the committee since her first day on the job in late February. Cut-through traffic in the community has been a concern for three decades, as commuters have cut through the neighborhood to avoid congestion on Main Street. When Virginia Regional Transit announced plans to establish a commuter parking lot along Hirst Road, residents feared that traffic would increase. In response to the concern, the town on Feb. 16 installed 10 removable barriers on Glenmeade Circle, just north of East Country Club Drive. Instead of cutting off the cut-through traffic, that pilot rerouted traffic from East to West Country Club Drive and to Glenmeade Circle. It was slated to end on April 9. According to a November traffic study, 193 vehicles were found to be cutting through the neighborhood along East Country Club Drive from 8-9 a.m. and 108 doing so from 4-5 p.m.
After the current pilot was implemented, 91 more vehicles were found to be passing through along West Country Club Drive from 6-9 a.m. and 65 more from 4-6 p.m. On Glenmeade Circle, there were 93 more from 6-9 a.m. and 65 more from 4-6 p.m. The new pilot is planned to remain in place for 30 days and will exempt buses and emergency vehicles from the restrictions. The town will remove the 10 barriers it installed last month on Glenmeade Circle between Ashleigh Road and East Country Club Drive on Thursday, April 19. Acting Police Chief Joe Schroeck suggested a three-week approach to the pilot, with traffic counts to be performed during the first week. Police officers would then issue warnings in the second week and summons in the third. “Hopefully people will get the message,” he said. Ashbacher said the town should get approval for the new pilot program from the town public works and police departments, American Disposal Services, VDOT, the school system, the postal service and county fire and rescue by the end of the week. 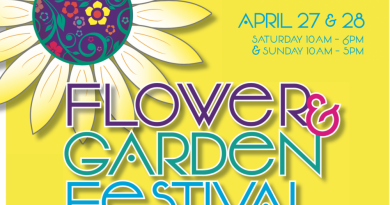 The town staff has estimated signage to cost up to $4,500 and is expecting it to arrive and be installed by the end of the month. “We’re trying to accelerate that as much as we can,” Ashbacher said. Just as with the first pilot that saw the installation of the 10 barriers on Glenmeade Circle in February, this new pilot comes with some resident backlash. Eight residents spoke during Tuesday’s Town Council meeting, two of whom argued that the town should focus on stopping cut-through traffic, as opposed to sending motorist on a longer route though the neighborhood. Vice Mayor Nedim Ogelman said stopping traffic wasn’t a viable option in this kind of situation. Oakleigh Court resident John Hildabrand also addressed the council at the meeting. In calling for the town to immediately remove the 10 barriers and all associated traffic control measures, he mentioned that some residents have started referring to Glenmeade Circle as “checkpoint Charlie” because of the speed humps and the flashing yellow lights and bright-orange flags atop signs. The Town Council’s decision to move forward with the new pilot comes partly in response to a resident survey that was conducted earlier this year. 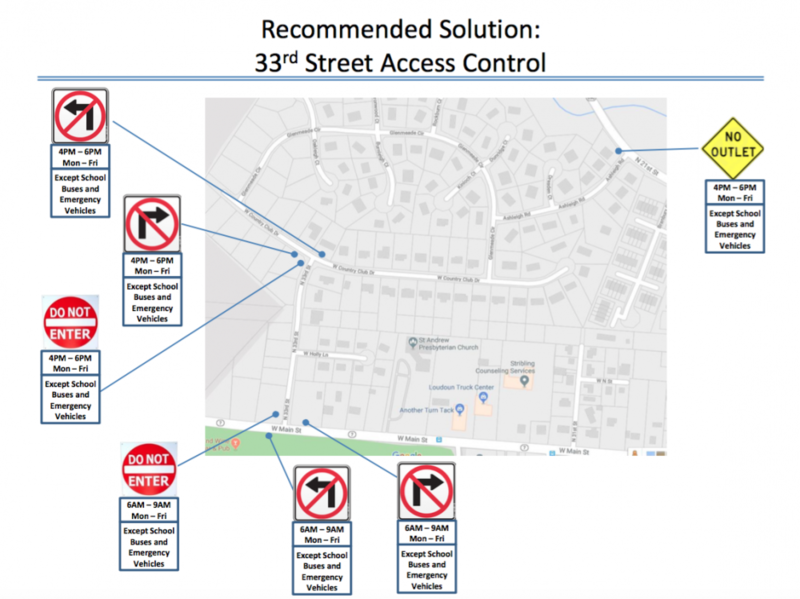 Of the 71 homeowners in the neighborhood who responded, 19 percent favored a program that would install removable barriers at the 33rd Street/Country Club Drive intersection. The next most popular option was the current committee-recommended signage installation, with 16 percent in favor of it. Although Ashbacher said that the first option would eliminate cut-through traffic in the community altogether, she said the committee did not recommend it to the Town Council because it would create only one entry point to both neighborhoods. The least favored options included installing barriers at the east and west ends of Glenmeade Circle and a variety of other signage scenarios. A depiction of the new plan to curb cut-through traffic in two Purcellville neighborhoods.